Walter G. Moss is a professor emeritus of history at Eastern Michigan University a Contributing Editor of HNN. For a list of his recent books and online publications click here. His most recent book is In the Face of Fear: Laughing All the Way to Wisdom(2019), which treats humor from a historical perspective. The main reason that Diesen thinks “the geoeconomic foundations for the West's primacy for the past 500 years is ending” is that it has overemphasized the individual, rational, impersonal, and contractual to the detriment of community, which places more value on the irrational, instinctive, and spiritual. (“Western civilisation prospered by embracing liberalism and rationalism, yet condemned itself to decay by self-identifying solely by these values.”) In reaction to this overemphasis, Western right-wing populism has emerged, spurred on by resentment toward globalization and immigration and encouraged by the likes of Donald Trump and France’s Maria Le Pen. Diesen’s criticism of identity politics fails to acknowledge, as Jill Lepore has indicated, that such “politics, by other names, goes all the way back to the founding of the Republic.” And “the identity politics of slaveholders and, later, of the Klan, and of immigration restrictionists, had been the work of more than a century of struggle—for abolition, emancipation, suffrage, and civil rights.” Although some fault might be found with the identity politics of recent decades for diluting “Rooseveltian liberalism” (Lepore’s view), Diesen’s simplistic critique lacks context and nuance and undervalues the virtues of pluralism. He goes on to opine that Western decay has sped up since the end of the Cold war. As globalization and new technology “centred on communication, automation, and robotics” has quickened, so too has growing inequality, “loss of civility,” political polarization, immigration, and hostility toward immigrants. Although he barely mentions nineteenth-century Russian nationalist thinkers, Diesen’s ideas are similar to theirs in many ways. Many of them, including Dostoevsky, thought that the West (by which they generally meant Western Europe and the United States) overemphasized rationalism, individualism, and money-making. Conversely, Russia was more religious and appreciative of non-rational elements and a spirit of community. In the mid-nineteenth century, the historian M. P. Pogodin wrote that the USA was “no state, but a trading company” that “cares solely for profit . . . She will hardly ever bring forth anything great.” In his book Russia and Europe (1869) the botanist Nikolai Danilevsky claimed that European civilization was not the only type of civilization and that there were no universal values, but that different historical-cultural types existed and that Europe and Russia belonged to two very different types. Western Europe, he believed, was decaying and an emerging Slavic civilization led by Russia was the great future hope. In his Winter Notes on Summer Impressions (1863), Dostoevsky criticized the West for its individualism and materialism. Later, in an 1880 speech he gave on the Russian poet Pushkin, he suggested that Russia might aid the West in helping it to regain a more spiritualistic basis for society. Despite some nineteenth-century Russian nationalists’ predictions of Western decline, few people in the western world before World War I (WWI) believed the West was declining. Prior to 1914, nine western European countries controlled over four-fifths of the earth’s lands, and the United States had also expanded the lands it controlled by annexing Puerto Rico, the Philippines, and Guam and making Cuba a protectorate. In his memoir, The World of Yesterday, the Austrian Stefan Zweig wrote of the late-nineteen century widespread belief in progress—e.g., electric lights, telephones, automobiles, improved sanitation and medical treatment, expanded voting, justice, and human rights, reduced poverty, and even the hope for more peace and security. WWI, however, changed such optimism. Over 15 million Europeans, soldier and civilians, lost their lives in to what many seemed a senseless war. France regained some territory it had lost to Germany in the Franco-Prussian War of 1870-71, but 3 of every 10 Frenchmen between the ages of 18 and 28 paid for the gains with their lives. In addition, the peace treaties that followed the war were unsatisfactory to many, especially in Germany, which helped give rise to Hitler. The mere title of the German Oswald Spengler’s Decline of the West (1918-1922) was just one of many signs that a fundamental change had occurred in Western confidence. The rise of communism in Russia, with Stalin eventually succeeding Lenin (d. 1924) as the Soviet leader; the rise of Italian fascism in the 1920s; the worldwide Great Depression of the early 1930s; Japanese aggression in Manchuria; and Hitler’s assumption of power in 1933 further sapped confidence in Western progress. Membership in western communist parties increased during the Depression, and not a few Western intellectuals, often fooled by Soviet propaganda, believed that more hope lie in communist Russia than in the capitalist West. Contrasting today with late 1932, when Depression gloom was at its height, it is difficult to believe the Western world is now in worst shape than back then. 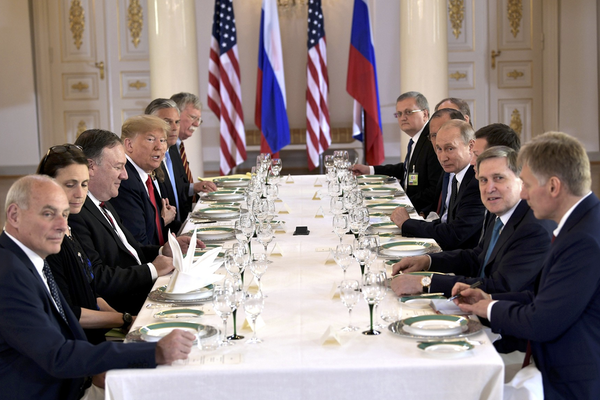 Is a Russia led by an opportunistic Vladimir Putin, allied with conservatives who have groveled to the likes of Donald Trump, really one of the world’s greatest future hopes? Can the West still not produce leaders of FDR’s caliber? Can it still not reinvigorate values that once helped make it great like freedom, democracy, equality, social justice, and tolerance?